Housekeeping your USB drive is as important as housekeeping your hard disk. Removing unwanted files, programs, documents, emails, etc that you no longer need will free up valuable space on your USB drive so that it does not get clogged with unwanted rubbish. Besides giving you more space to work, your important files won’t be easily mixed up with unwanted ones and probably accidentally deleted or overwritten by you. To keep your USB drive clear and clean from time to time, there is a handy and tiny application namely USBDriveFresher you can consider. 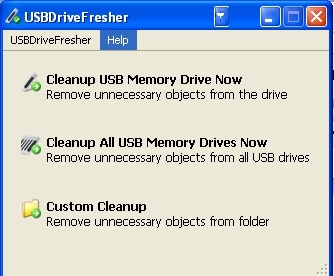 Users can download the freeware USBDriveFresher via the link here. The application supports Windows 98/NT/2000/XP/2003 and Vista. Once it is installed, a small tiny will appear in the taskbar. 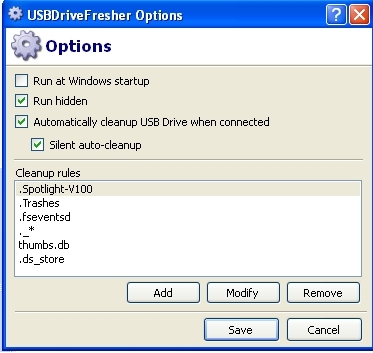 Users can double click the icon to perform the USB drive cleaning. The application generally offers three cleanup processes. 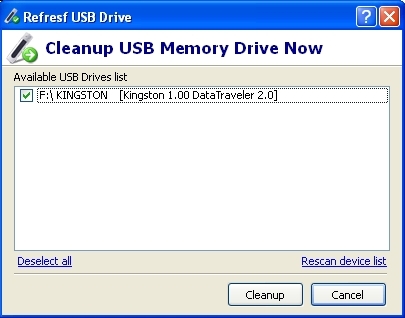 Users can choose to cleanup a particular USB memory drive, all USB memory drives or do custom cleanup.